A robust folding plastic crate designed to fit front mounted Steco luggage racks, measuring 40 cm x 30 cm x 17 cm (16" x 12" x 6.5"). 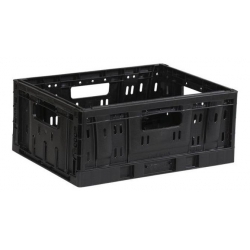 If you need to carry something too large for the crate you can fold it flat and it is then just 5.5 cm (2") thick. See the additional photos for details of the folding mechanism. Note that if you use this on a frame mounted rack then you must have adequate handlebar clearance. You may need a taller stem. For a non folding option, see the Basil crate.